After 16 months of trying, and some considerable blame dodging from RSA, I have finally had a cheque from Royal & SunAlliance to compensate me for the items stolen from my car. Why did this take 16 months? Who knows. Anyway, my car has today been picked up again and taken to BMW Hanforth, where hopefully they’ll be able to put right what once went wrong in a Sam Beckett sort of way. 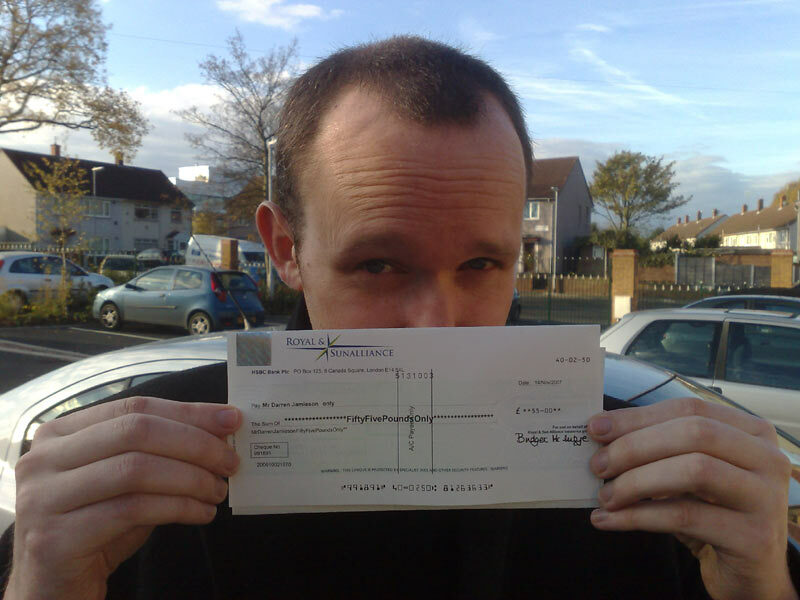 Here’s a photo of me with the cheque. You can feel my sense of disbelief that this has all happened. Well done Mr Daz! I knew after fighting for months that you would get something out of them. However, I did expect a little bit more than 50 pounds. £55! That’s all I asked for. It’s incredible isn’t it that I went through all of this for £55, just like Mel Gibson in Payback, he only wanted what was owed to him but because of the lengths he was willing to go to they assumed it would be more. Nope, just £55, and my car fixed of course. I’m practically extorting them eh? Ironically i worked for SunAlliance many moons ago as a statistical analyst + i was bored outta my friggin’ Gourd!! I thought don’t tell me i did a B.Sc. in Mathematics to end up Colouring Rate Charts with Crayola Pencils! !